1 – A seminar entitled Developing Creative Speaking Activities for your Classes led by Alun Phillips. The seminar will be held in Compalto (VE) on May 15, 2014. View poster here. 1 – A TESOL Day entitled Motivating Good Practices with eight speakers. View Flyer here. 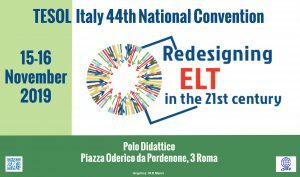 2 – An afternoon seminar entitled Quando la dislessia entra in classe led by Paola Eleonora Fantoni. View poster here. 3 – An afternoon seminar entitled Tecniche e strategie glottodidattiche al servizio dell’apprendimento scolastico disciplinare led by Paola Celentin. View Poster here. 1 – A seminar entitled Digital Workbooks: How to Integrate Digital Material into the Lesson. In collaboration with MacMillan and led by P. Moura and D. Londsdale. 2 – A seminar entitled The Telepathic Way of Communicating Doesn’t Work! Getting Students to Speak. In collaboration with ELI led by T. Sinclair.